Home > Blog > Domestic Scarifiers Vs Commercial Scarifiers: What’s The Difference? Domestic Scarifiers Vs Commercial Scarifiers: What’s The Difference? 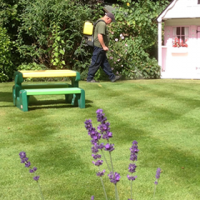 When we provide people with a free lawn analysis quotation, the chances are, providing that they haven’t had their lawn treated before, their lawn will require a scarification. 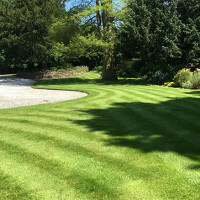 When people have already attempted to scarify their lawn themselves with a domestic machine, the damage can often result in the lawn taking quite a long time to recover. 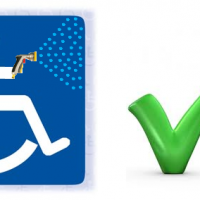 They can be purchased in common DIY shops, they’re electric powered and are a similar size to an electric lawn mower. They’re also known as electric rakes. 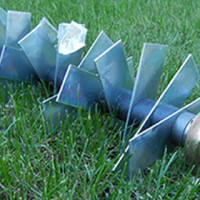 The blade system consists of wire springs that rotate in an attempt to rip out thatch from the lawn. However, because the blade system is not powerful enough to go very deep into the turf, a very poor job is usually completed and often results in destroying the grass stallion with a splitting action. This allows disease to enter and dead areas start to appear. A lot of people seem to use their electric rakes incorrectly as well by continuously running them over the same area until the grass plant is completely destroyed and bald patches appear. This electric rake is classed as one of the “better” domestic scarifiers available. Notice that the thatch is barely being pulled out of the lawn and the scarifier is throwing dust-like grass everywhere. Compare this to the video at the bottom of the page to see the difference in thatch removed. The commercial type machines that we use have a solid or folding flail blade system. These are pushed so that the user is aware when the machine is “biting” the turf. Some machines are powered, but only if the rotation of the blades is opposite to the direction of travel. In simple terms, the machine is powered forwards if the drum rotation is pushing backwards. Flail blades continuously rotate as the entire shaft rotates, where as straight bladed machines don’t but create ideal lines in the turf for seeding afterwards. The thickness of the blade and type of machine required must match the turf type though. For example, fescue grasses will require a thin bladed machine and need to hit the soil to a depth of approximately 5mm. Once all of the debris has been cleared from the lawn, commercial machines leave a very clean area in comparison to domestic machines which tend to just rip the thatch upwards but not completely pull it out from the turf base. Overall, domestic machines either aren’t powerful enough to pull the thatch out properly, or the user runs them over the same area for too long, leaving no grass left. 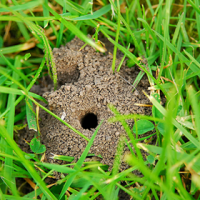 In most cases, the process of scarification should be quite ruthless, but not to the extent where it ruins the lawn. The only exception to completely ripping out all the thatch would be when over-seeding and top-dressing renovation methods are to be completed afterwards. Here’s a video of a commercial scarifier to show you what we’re talking about. Notice how the machine is quite powerful and is ripping out the thatch very effectively. It may look like seeding would be required afterwards at minimum. 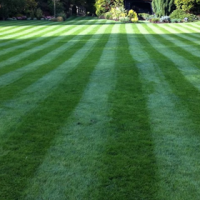 However, the lawn was not seeded or top-dressed and was back to good health in around 4 weeks. Our opinion may always seem biased on this topic, but commercial machines are clearly the only way to complete an effective job of moss and thatch removal. We can’t stress this enough. Knowing how deep a scarifier can be used on a lawn, without causing any damage takes years of experience and carful judgment of the operator. Remember, scarification is not designed to remove all moss from a lawn.